Explore an underground world of wonders! 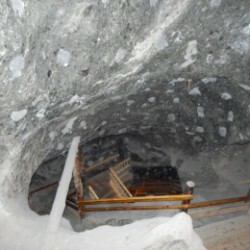 We offer You a unique opportunity to visit a salt mine operating constantly since the Middle Ages! It is one of the two such facilities in the world (another is located in nearby Bochnia). Amazing microclimate, huge chambers and chapels hallowed in rock salt as well as underground lakes – all these things You could see during our long escapade through the mining walks. Wieliczka Salt Mine delights tourists from all over the world and is one of the greatest attractions located near Krakow. Salt deposits mined in Wieliczka are 15 million years old! The oldest traces of their exploitation by man comes from 3 thousand years BC. Initially, local people extract the salt by evaporating water from brine naturally flowing out of the ground. In the early Middle Ages (XII/XIII century) the first mineshafts were hollowed. Salt was one of the main riches of the Krakow region and Polish monarch surrounded the mines in Wieliczka and Bochnia with their special care. In the late 17th century the medical care of the miners was held by the real Polish Dr. Queen – Magdalena Bendzisławska, who took over the practice of her deceased husband and received a diploma confirming her competences as a surgeon from the King himself. It is only one of many fascinating stories associated with Wieliczka. The Mine is really huge, its oldest preserved parts comes from the 13th century and the lowermost level is located at a depth of over 300 meters! There is no surprise in fact, that it is on the UNESCO World Heritage List. Morover, this is probably a place, that reminds Tolkien’s Moria most in the world. 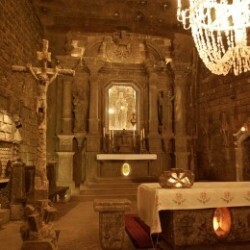 During the Wieliczka Salt Mine Tour we move along so-called ‘Tourist Route’, which includes all the most beautiful objects (among them the wonderful Chapel of St. Kinga). However, there are other possibilities. On the ‘Miners’ Route’ You could prove Yourself, exploring the less known corridors in special helmet and overalls, with pickaxe and a flashlight. On the ‘Pilgrims Route’ You will visit all amazing places of cult located in the mine chambers. Among the guests admiring the wonders of Wieliczka Mine were Goethe, Mendeleev, Bill Clinton and Karol Wojtyła. It is high time to follow in their footsteps! 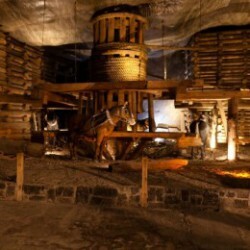 Krakow Guide will help You with booking Wieliczka Salt Mine tour. 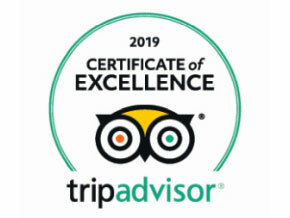 We provide transportation from Krakow to Wieliczka and back. 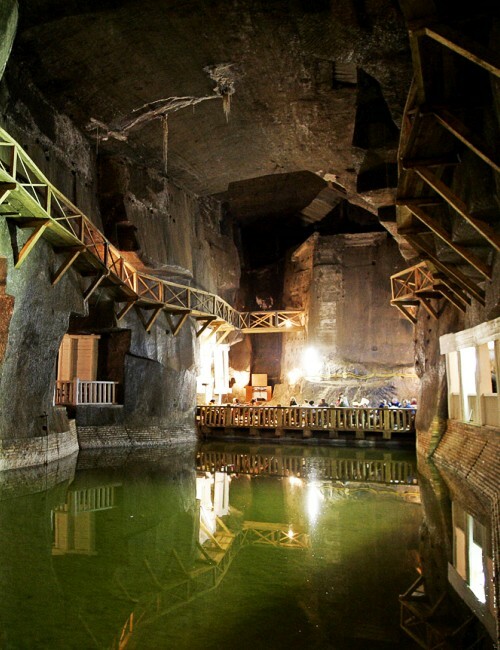 Join us and see the underground wonders! Due to low temperatures in the mine (14-16˚C), please supply in warm clothing, comfortable shoes are also highly recommended! The famous astronomer probably visited the mine in the late 15th century, which is commemorated by the name of this chamber founded in the 18th century. There are original wooden constructions. You can also see there a beautiful, made of salt statue of Nicolaus Copernicus. In the Janowice Chamber situated right next to the Chamber of Copernicus there are also some salt figures illustrating a famous legend about the discovery of salt deposits near Krakow. The oldest chapel in the mine. The Chapel of Saint Anthony was made in the 17th century. It is absolutely unique example of Baroque sacred interior located deep beneath the earth’s surface. Although it is not huge, the chapel has a chancel, nave, main altar and two smaller side altars. Both the architecture of the interior designed with highest finesse and subtle and the salt statues of saints create an amazing atmosphere. Both the architecture of the interior designed with highest finesse and subtle and the salt statues of saints create an amazing atmosphere. In this place we can find out, what threatened the miners working in Wieliczka. A fire broke out there once and destroyed all wooden constructions. Nowadays, there is an exhibition presenting centuries-old ways of avoiding the risk of that kind. You will know everything about firing the gas collected in the recesses and about special pillars called “witnesses”, which warned the miners against the walls collapse. There are some interesting reconstructions of the old mining machines and devices in this hall and the nearby Sielec Chamber (for example a treadmill moved by horses, trolley called the ‘Hungarian Dog’ and special sleds). 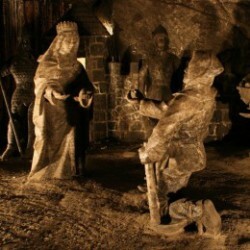 Polish 14th-century monarch, King Casimir the Great played an important role in the history of Wieliczka Salt Mine. He issued the Statute of the Krakow Saltworks, an act regulating the functioning of salt mines. Today, there is a King’s bust (made of salt of course) in the chamber. During this part of trip You will see the very old stairs leading to the next level of the mine and used by. Wieliczka miners for centuries! You will probably meet also some dwarfs. 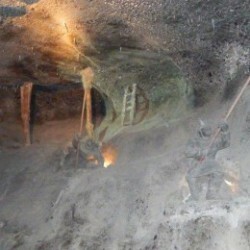 An exhibition in the Pit of Kunegunda presents the equipment used for salt evaporation. They are based on technological ideas known since the Neolithic times. The chapel was built in the 19th century as a votive offering for saving the mine from flooding. The equipment of the chapel is much older than the chamber – beautiful, wooden crucifix from the 17th century was portable originally. In the old days the miners move chapels, changing place of work. Probably the most beautiful place in the mine! The chapel was constructed in the late 19th century. Stunning, sacred interior lying 100 meters beneath the earth’s surface. 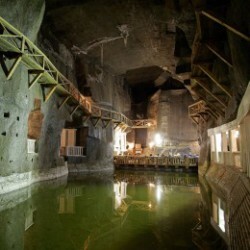 It is the largest underground temple in the world (54 m long and up to 12 m height). In the chapel You could see a copy of the famous Last Supper made of salt and bas-reliefs depicting scenes from the New Testament. Fabulous chandeliers made of salt crystals, flashes of light on the floor made of salt monolith – the view is breathtaking! Its name is associated with Johan Wolfgang Goethe, who visited the mine once (as You probably know, he lived in Weimar). In this chamber You can admire the beautiful, picturesque salt lake from the special viewing platform. The play of light and shadow on the surface of the water and shimmering salt walls create an amazing combination! There are other halls with the salt lakes inside, for example the Chamber of Józef Piłsudki, that we also see. Stanisław Staszic was an excellent geologist. This hall is distinguished by its incredible height reaching 50 meters! During the World War II Germans had the rather unusual idea to locate there an aircraft assembly plant (it would be perfectly hidden from their enemies!). The project was never finished. You will also see there the statue of the Treasurer – the caring spirit of the mine. Walking through another mine chambers, all of them full of wonders, visitors get finally to the Chapel of St. John with a wonderful wooden equipment inside. The chapel is decorated with colourful wall paintings. The astonishing, coloured landscape of Jerusalem creates the background for a wooden crucifix. 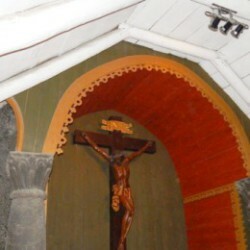 The sculpture of the crucified Christ comes from the 18th century! All these marvels at the depth of 135 meters below ground!